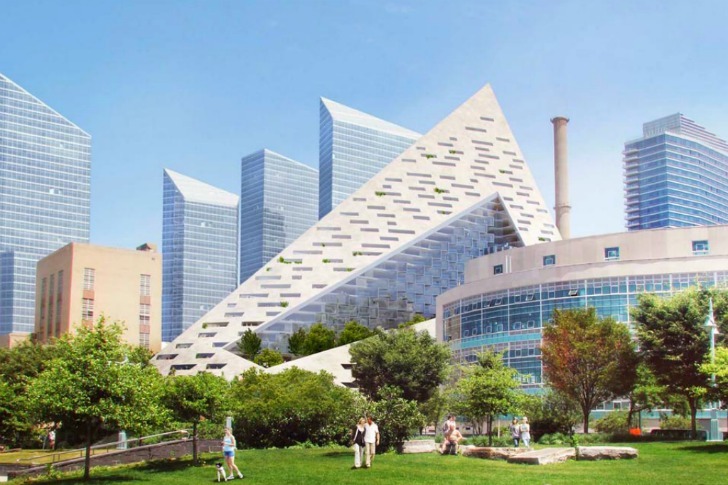 Plans for BIG's exciting West 57th pyramid-shaped residential project were unveiled last spring. We're happy to report that the radically different tower project is still moving forward and BIG's New York City office is open for business. With 15 staffers and a number of North America based projects under their belts, the Danish firm led by Bjarke Ingels, has officially crossed the pond and is set to make some waves in American architecture. The new residential project located on West 57th and the West Side Highway, the dramatic form rises steeply from the ground up to a height of 450 feet in the back making way for views, daylighting and green courtyards. Combining more traditional European-style courtyard block architecture with the NYC skyscraper, West 57th will be a welcome departure from boxy, boring buildings. Last week, the Bjarke Ingel Group (BIG) celebrated the opening of its new office in the Starrett-Lehigh Building at 601 West 26th Street. Sharing digs with the likes of Martha Stewart Omnimedia, BIG is now settled in and working hard on their North American projects, most notably the West 57th residential project for Durst Fetner Residential, which specializes in high-profile New York real estate. Last February, BIG unveiled plans for the unconventional high-rise apartment building and spent some time answering questions at a community board meeting. Overall, the reaction was positive, although the community board had concerns over what kind of retail would be allowed with preferences towards local and smaller businesses. The board also requested more green spaces be open to the public. The 600-unit complex, which will include a number of affordable housing units, is expected to create an important bridge between the neighborhood and the waterfront. Retail, businesses, a cultural space, and a grocery store will line the storefronts of the bottom floor, and then residential apartments will rise up and back away from the waterfront. This pyramid-like volume was specifically designed for the site to protect the residences against a neighboring garbage dump truck garage, preserve views from surrounding buildings, but still give the new residences access to views and daylighting. Each apartment enjoys a south-facing terrace and access to the large private courtyard in the center. Although now an empty lot, the residential rental tower is expected to begin construction sometime in 2012 with an completion date in 2015. Last week, the Bjarke Ingel Group (BIG) celebrated the opening of its new office in the Starrett-Lehigh Building at 601 West 26th Street. Sharing digs with the likes of Martha Stewart Omnimedia, BIG is now settled in and working hard on their North American projects, most notably the West 57th residential project for Durst Fetner Residential, which specializes in high-profile New York real estate. Last February, BIG unveiled plans for the unconventional high-rise apartment building and spent some time answering questions at a community board meeting. Overall, the reaction was positive, although the community board had concerns over what kind of retail would be allowed with preferences towards local and smaller businesses. The board also requested more green spaces be open to the public. The 600-unit complex, which will include a number of affordable housing components, is expected to create an important bridge between the neighborhood and the waterfront. Retail, businesses, a cultural space, and a grocery store will line the storefronts of the bottom floor, and then residential apartments will rise up and back away from the waterfront. This pyramid-like volume was specifically designed for the site to protect the residences against a neighboring garbage dump truck garage, preserve views from surrounding buildings, but still give the new residences access to views and daylighting. Each apartment enjoys a south-facing terrace and access to the large private courtyard in the center. The residential tower is a combination of a traditional NYC skyscraper on a podium with a European-style courtyard building. The building is extruded up in the back revealing a dramatic southwest facing slope. All apartments enjoy views out onto the water. Each apartment enjoys south facing access for natural daylighting. Although now an empty lot, the residential rental tower is expected to begin construction sometime in 2012 with an completion date in 2015.